For the 2016-2017 academic year (July 1, 2016-June 30, 2017), Prof. Yu was on sabbatical from UBC as the Stanley Kelley, Jr. Visiting Professor for Distinguished Teaching in Asian American Studies at Princeton University. Henry Yu is involved in the collaborative effort to reimagine the history of Vancouver and of British Columbia through the concept of "Pacific Canada," a perspective that focuses on how migrants from Asia, Europe, and other parts of the Americas engaged with each other and with First Nations peoples historically. Read "Our Own Not-So-Quiet Revolution" and Prof. Yu's essay "Global Migrants and the New Pacific Canada," written for the 25th Anniversary of the Asia Pacific Foundation. Also visit Henry Yu's blog "Past Present" at http://henryyu.blogspot.com. Prof. Yu has been the Principal since 2011of St. John's Graduate College, UBC's international graduate college, and served as its Associate Principal from 2005-2009. Prof. Yu is also the Director of the Initiative for Student Teaching and Research in Chinese Canadian Studies (INSTRCC), the first stage of a long term commitment at UBC to the study of trans-Pacific migrations and the long history of interactions between Asian and European migrants and First Nations peoples in Pacific Canada. Watch a series of films entitled "Eating Global Vancouver" that were made by students at http://www.youtube.com/instrcc. In May 2014, Prof. Yu had the privilege of bearing witness to the historical apology by the Provincial Legislature of British Columbia as Premier Christy Clark formally apologized for the province's long history of anti-Chinese legislation. Prof. Yu had contributed to the drafting of the text in the Final Report outlining the historical context for the official apology, and was appointed in the Fall of 2014 as Co-Chair of the Legacy Initiatives Advisory Council which helps oversee and advise Minister Teresa Wat implement the series of legacy projects that followed the legislative apology. In 2016-2017, Pr. Yu served on the City of Vancouver's Historical Discrimination Against Chinese Peoples Advisory Committee, advising the City after a motion by Mayor and Council to consider an apology for Vancouver's history of anti-Chinese legislation and discrimination. He also serves on various other volunteer working committees concerning Vancouver's Historic Chinatown. In 2012, Prof. Yu was a member of the committee that organized the granting of honorary degrees from UBC for the 76 Japanese Canadian UBC students who were removed from the west coast in 1942. Many of these students were unable to complete their studies or to attend their graduation, and their belated recognition as UBC alumni was part of a remarkable ceremony in May 2012 on the 70th anniversary of their forcible removal from their school and homes. See http://japanese-canadian-student-tribute.ubc.ca/ for more. As one of the commitments made by UBC Senate to honour the Japanese Canadian students of 1942, the new Asian Canadian and Asian Migrations Studies program was launched in the fall of 2014. Prof. Yu is committed to expanding the engagement between academic research and the communities which the university serves. He was the Project Lead for a $1.17 million project entitled "Chinese Canadian Stories: Uncommon Histories from a Common Past" (chinesecanadian.ubc.ca). Receiving $950,000 from the Community Historical Recognition Program of the Canadian Federal government, this project aimed to gather the ignored histories of Chinese Canadians and to use the latest in new media technologies to present a new understanding of our common history. As part of the project, Prof. Yu's research team collaborated with the Spatial History Lab at Stanford University in creating state of the art visualizations of historical data. See them at the Stanford website. Prof. Yu served between 2010-2012 as a Co-Chair, along with Susan Tatoosh of the Vancouver Aboriginal Friendship Center and Councillor Wade Grant of the Musqueam Nation, of the City of Vancouver's "Dialogues Between First Nations, Urban Aboriginal, and Immigrant Communities in Vancouver," a unique and important series of projects that aimed to promote engagements between communities that are often considered separately. Each summer Prof. Yu takes students on a unique six week summer field course. In 2005, Prof. Yu and Jennifer Lau took students from classes at UBC and UCLA on a course comparing Asian migration and its effects on Vancouver and Los Angeles. Entitled "Eating Our Way from Vancouver to LA," the course focused on food and restaurants as a way of understanding cultural change. In the summer of 2007, Prof. Yu took UBC students on a joint field course with University Scholar Program students from the National University of Singapore. Entitled "Eating Our Way Across Southeast Asia," the 20 UBC and NUS students, along with Jennifer Lau and fellow UBC Professor emeritus Graham Johnson, literally ate their way through Hong Kong, Guangzhou, Singapore, Malacca, and Kuala Lumpur. The summers of 2009 and 2010 saw students from UBC and from NUS each spending two weeks in Vancouver and Singapore in group research projects comparing the two cities, and of course sampling the other city's cuisine. Watch a film made by the students examining how the two cities have dealt with their historic "Chinatown" districts. In May-June of both 2012 and 2013, Prof. Yu and Wendy Phung took a set of students on an exchange with Hong Kong University, and with Alyssa Leung and Joanna Yang repeated the program in the summers of 2014 and 2015. In May of 2016, Prof. Yu along with Joanna Yang, Belle Cheung, and Zoe Lam organized a unique exchange class with students from UBC and Chinese University of Hong Kong, with UBC students visiting the UNESCO World Heritage Site in Kaiping, Guangdong, China. Click here. A Founding Board Member of the Chinese Canadian Historical Society of British Columbia http://www.cchsbc.ca, Prof. Yu continues to serve on the Board of Directors and actively engages his UBC students in community history projects through CCHSBC. His essays are featured in two of the CCHSBC's books, Tracing Memories, Finding Routes (2006) and Eating Stories: A Chinese Canadian and Aboriginal Potluck (2007), as well as in the introduction "1788" for CCHSBC's documentary "Bamboo and Cedar" about engagements between Chinese Canadian and First Nations historically. Prof. Yu and Prof. Peter Ward were co-investigators in a SSHRC funded project involving the creation of a digital database of the approximately 96,000 Chinese Canadians who paid the discriminatory Head Tax between 1885-1923. This project involved student research assistants Jason Chan, Mary Chan, Denise Wong, and PhD student Feng Zhang. This database enables Chinese Canadians whose ancestors were Head Tax payers to search digitally for their records. The fully searchable datable can now be found at Chinese Canadian Stories. Watch a CBC news story with Prof. Yu explaining the Chinese Head Tax Digitization Project. Read more about the Chinese Head Tax Digitization project in a story by Lisa Stedman of the Vancouver Courier from September 29, 2006 and an essay written by Prof. Yu for Library Archives Canada's online collection on Chinese Canadian history. See one of the results of a Geographic Information Systems project undertaken by Edith Tam, Maria Ho, and Jeremy Alexander students of Prof. Sally Hermansen of UBC Geography. Prof. Hermansen's students mapped the destinations of Chinese Head Tax Payers between 1910 and 1923. During 2007, Yu was the Co-Chair of the Anniversaries of Change Steering Committee, representing a network of community and cultural organizations, educational institutions, and labour organizations coming together to mark a series of important anniversaries in the history of Vancouver and Canada. After a year-long series of events, the Anniversaries of Change partnered with the British Columbia Teachers Federation to obtain a grant from the Law Foundation of British Columbia to create teaching resources for B.C. high schools (see the intro to the "Pivotal Voices" resource from The Critical Thinking Consortium. Yu is currently writing a book entitled Pacific Canada, another book entitled How Tiger Woods Lost His Stripes, as well as a third book project which examines the history of Cantonese migration in the Pacific world. 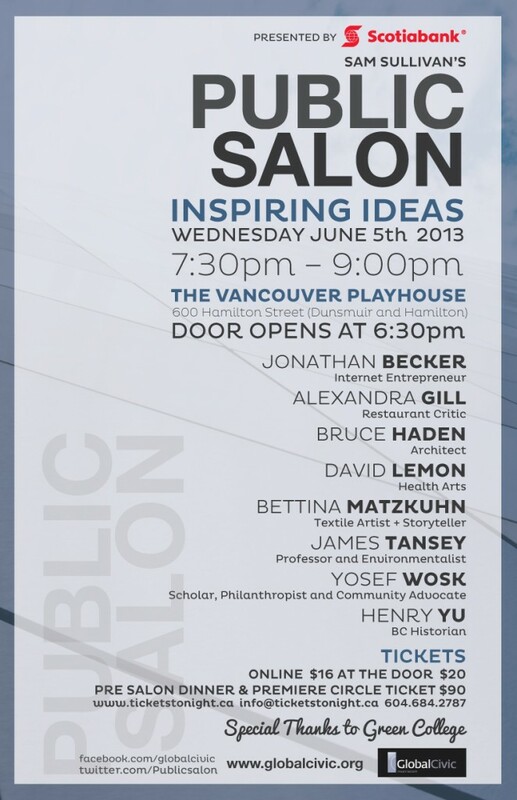 Prof. Yu spoke about the concept of "Pacific Canada" at Sam Sullivan’s Public Salon on June 5, 2013 in Vancouver BC. In May 2005, Yu was chosen by the History New Network as one of its "Top Young Historians." Read about it here. In September 2007, Prof. Yu was featured in the Georgia Straight's annual "Best of Vancouver" Issue as one of the city's "Bright Lights"
In October 2007, Prof. Yu was honoured as an "Unsung Hero" in a "Spotlight on Leadership" event sponsored by the North American Association of Asian Professionals (NAAAP) held at the CBC in Vancouver. In 2012, Prof. Yu was honoured for his work with a Queen Elizabeth Diamond Jubilee Medal. In 2015, Prof. Yu received the Multuralism Award from the Province of British Columbia. Prof. Yu lives in Vancouver with his four children and his wife, Ai Mizuta. See Dr. Yu on Waterfront Cities with host Heidi Hollinger discussing Vancouver. H. Yu. Thinking Orientals: migration, contact, and exoticism in modern America. New York: Oxford Universtiy Press, 2001. Received the Norris and Carol Hundley Prize for Most Distinguished Book of 2001, AHA-PCB. “The Irony of Discrimination: Mapping Historical Migration Using Chinese Head Tax Data,” with Sally Hermansen, in Jennifer Bonnell and Marcel Fortin, Editors, Historical GIS Research in Canada (Calgary: University of Calgary Press, 2014) 225-237. At UBC, Dr. Yu serves on the Provost's Advisory Committee on Equity, Discrimination and Harassment and on the Dean of Arts Advisory Committee on the Asia Pacific. Revisiter l’histoire de Vancouver et de la Colombie-Britannique en mettant en lumière la manière dont les immigrants d’Asie, d’Europe et d’Amérique ont tissé des liens entre eux et avec les Premières Nations, et montrer, à l’aide du concept de « Pacifique Canada », comment ces communautés ont contribué à faire l’histoire du Canada ; telle est la ligne directrice dans la démarche de l’historien Henry Yu, plusieurs fois décoré pour ses travaux. Dans ses recherches aussi riches que variées, il s’est par exemple intéressé à la question des restaurants comme vecteurs de changements culturels. Le directeur du St. John's Graduate College, du UBC's International Graduate College et de la Initiative for Student Teaching and Research in Chinese Canadian Studies (INSTRCC), qui est aussi l’un des membres fondateurs de la Chinese Canadian Historical Society of British Columbia, travaille présentement sur un projet d’envergure : une base de données recensant les près de 97 000 Chinois canadiens qui ont dû payer la fameuse taxe d’entrée (de 1885 à 1923), imposée par l’acte de l’immigration chinoise de 1885 ; une loi discriminatoire qui visait à limiter l’immigration chinoise au Canada. En attendant la parution des ouvrages sur lesquels Henry Yu travaille actuellement, les curieux peuvent lire Tracing Memories, Finding Routes et Eating Stories: A Chinese Canadian and Aboriginal Potluck.